We have mandatory recycling in our township. This morning the little dog from down the road was at my door with her tongue caught in a soup can. Someone had not fully removed the lid and I guess she got into their recycling bin. I brought her in (she spends 90% of her time with us) and managed to get a knife and pry the lid up so she could get free. I was really worried because I saw some blood around her mouth but it looks like she just has a small cut under her tongue. Right now she is having a nap in the centre of our bed, her favourite spot. When I drop off the Hallowe'en bags I will tell her owners to keep an eye on her just in case. Will remind the other neighbours to be sure to remove all lids as Luna is a roamer. Poor pup! I don't think too much about not removing lids completely and sometimes I don't. I don't always remove it completely because as you approach the end of removing the lid, it tends to lift up slightly, making it easier to open it up and then I don't finish cranking the opener. I'll have to try to remember to do that. I get a bit carried away with cutting up the plastic rings that things like soda bottles or cans sometimes come in. Too many birds or other wildlife get tangled in those. Good reminder. Oh geez...poor thing. Good that you noticed and were able to free her. I sometimes see the way neighbors put out cans and bottles (spilled out of containers into the street...which I pass on my daily walk) and cringe, thinking about the wildlife. If cans aren't washed, they're a certain lure. And glass obviously gets broken if it drops...the recyclers don't pick that up and a lot of our neighbors don't seem to care even if they have to drive/walk through it to get their mail. I use an opener that removes the end of the can with a smooth edge. I think our recycling is restricted to only the cans if you remove the ends in such a way as to leave a sharp edge...for the safety of the workers. We've never had critters express an interest in our boring recycling...thankfully. I am curious as to how she spends all this time with you and knew to come to you for help? Does she sleep over too? I am fascinated when dogs pick someone else to be their owners. This happened to a friend of mine. She has a Weim and she had a doggie door and a fence for him but a tree limb had fallen down and broken part of the fence. 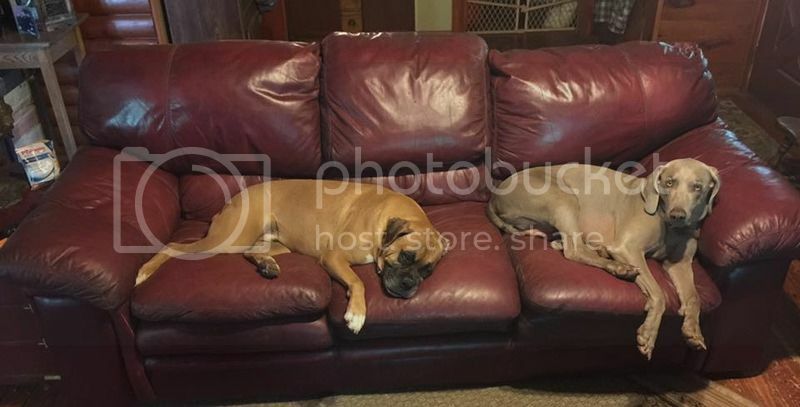 One day she came home and found a pure bred Boxer snoozing on the couch with the Weim. He was thin so she fed him. He would come and go, sometimes staying a couple of days and then leave for a couple of days. He would even sleep with her at night. Sweet, sweet dog. So a rather long period of time goes by where she doesn't see him. Then he shows up and his owners, whoever they were, had tied him up *around his waist* with rope and clearly had not fed him for days. The rope had rubbed him completely raw around his waist and he was super thin. She said "That's it!" Took him to the vet to see if he was chipped, he wasn't. Vet fixed him up, she fixed the fence and now he lives comfortably with my friend. This is Joe Boxer and Gunner. That line near his hip is the scar from where the rope rubbed him raw. Thanks for taking care of the little visitor! There is a dog at my local dog park named Leo that has taken a liking to me. His owner is very nice and she does not mistreat him in any way but he just LOVES me. Whenever I show up and he is there, he will come running full speed to me and acts like he hasn't seen me in ages. He will actually put his paws on my shoulders and "hug" me. He follows me everywhere and always tries to go home with me when I leave. It's funny how some dogs pick us. Luna has quite an interesting background. She is a recue pup from Northern Canada, a remote aboriginal/ Hudson Bay Co village on James Bay called Moosenee/ Moose Factory. It was originally a fur trading out post for the Hudson Bay Co. Every spring a group from our area travel north and round up 30 or 40 puppies and bring them south. They vet, spay/neuter them and then place them. The community up there just let their dogs run free. Luna is the same age as my lab and as a puppy I would see her in the their drive or in the ditch by the side of the road. Gradually she made her way over to the house and would watch my dogs. It took her quite awhile to come close but eventually she let me pet her. The young couple that owner her are very good to her and she loves their two children but it is a long day when no one is home. Luna's routine now is that after they leave for work by 8:00 she comes to the front door I let her in and she gets on the bed with my husband. When he gets up all the dogs get 3 biscuits, it is an amusing sight to see all four locked on his every step to the biscuit box. From 10:00 to 1:00 they all go in and out several times and then at 1:00 Luna comes in for her nap. She loves the fuzzy comforter. Again it is in and out till about 4:30 when she boots it for home because the mom and kids are home. At 6:30 she is back to go for the evening walk with my husband and the dogs. She is a sweet little dog and over the last two years has become much more social with all the people coming and going here. She loves to eat, guess it comes from being a feral puppy. Denise once said she was worried about Luna because she would often pass over her dinner and go straight to sleep. I told her not to worry as Luna shares M food all the time, cleans out any left overs and has her biscuits. She also will go in an clean up the left overs at my sisters. She's also probably tired from all the running and playing she does with my dogs or any of our frequent visitors. I really like this little mutt. I even replace her scarves as M like to tear them off her. I love all of that! What a great life she has!!! I love that she comes over and climbs in bed with your husband. Thank you for being so good to her. Yup, just warned a man we met on the trail yesterday to not let his Lab go up a bank to the house up there because the owners up there have a garbage pit with cans in it. Right at the top of the bank, almost like on purpose. Think they burn stuff there. Another dog walker warned me about it. These people have dogs of their own, which they let run loose, hope theirs are ok. I think we need a photo of Luna with her scarf. Yes!! This!! I would love to see what she looks like. Getting a new server on Friday. Finally saying good bye to dial up service which makes posting picture impossible. Got a new camera too. Just maybe I will be able to learn how to post pictures of the gang.